Over a period of 140 years, Geberit has moved from being a family run business to a global public company. It has long been recognised that Geberit is the European market leader in sanitary technology and has long been regarded as a pioneer, constantly setting trends and innovating product ideas that help in the conservation of water. The impressive product range is designed for use in new building as well as where renovation is being considered, particularly with a view to modernisation. Geberit has long recognised the need for better hygiene, and one of the first innovations was in 1978 when they introduced, the then revolutionary, Geberit toilet with a shower function. Although slow to be accepted at first in Europe, the product became very successful, nowhere more so than in Japan, where it became an overnight success! One of the increasingly popular items from Geberit found at the UK Bathrooms web page is a system that allows the toilet to be flushed without having to press a button or turn a handle and the Geberit Sigma 10 Touchless flush plate is proving to be a winner. This 21st century touchless plate not only uses the latest in today’s technology, but it has a very sleek look and it also presents a low anti-vandal profile. The Sigma 10 is available in seven colour mixes, is equipped with water-saving dual-flush technique, with an option for a battery operated version if preferred. Naturally the Geberit Sigma 10 is offered to you at UK Bathrooms unbeatable low prices, which are the cheapest to be found anywhere and can be delivered to you in just one or two days. So the Super Loo 1000 from Umai Yarikata Toire (Magnificent Toilet) wasn’t real, we got you there, April Fools! So you don’t need to start about ripping out your bathroom suite and doing away with your showers and baths. However if you are looking for a new bathroom, then there is some fantastic new products which, themselves could almost be April Fools, but they are real and would make ideal additions to any bathroom! For that added bit of luxury The Imperial Radison Cureo Cast Iron and Real Leather Bath really is a wonderful option. Yes that’s right a leather bath, the trim is made from a gorgeous chocolate leather strip which has been hand stitched and looks stunning. The bath is made from cast iron but the leather is what makes it unusual and would be a nice luxurious touch in a bathroom. One of our favourite bits of top tech for the bathroom is the Kaldewei Soundwave Sound System for Baths. With this you can turn your bath into a giant speaker, all without getting electrocuted! In an effort to bring relaxation to the next level the bath uses Bluetooth to connect to either your iPad, iPhone, laptop or any Bluetooth enabled device and can play music through 6 acoustic panels. Reminiscent of the conical bra worn my Madonna, the Madonna Radiator from Aeon really will add an intriguing touch to your bathroom. You might be warned to make sure you don’t poke an eye out with it though! Quite ingenious really, the Axor LampShower 1jet overhead shower from Hansgrohe is a lampshade shape shower head, a bulb sits above the shower head lighting up your shower. Completely safe the integrated lighting is completely protected from the water so you won’t get any nasty shocks. It’s the big question we’re all faced with when decorating a home: what style of bathroom to go for. For the coming year, bathrooms are returning to more classic styles, featuring a lot less clutter and more simplistic designs. You have the option to either go for a sleek and stylish modern look, or to look at traditional pieces that will never go out of style. There are two main brands that stand out in on trend bathroom design this year: Imperial for long lasting, traditional pieces, and Roper Rhodes for a contemporary and sophisticated look. Both are high quality British brands, and there are huge savings for their products at UK Bathrooms. Imperial bathrooms are known for their traditional yet opulent pieces, reminiscent of times gone by. Add a little of the glamour from the 1920s art deco era to your bathroom with an Imperial Astoria Deco Basin and Stand; its polished chrome or antique gold legs will finish off the bathroom with a stylish flair while also being completely functional with integrated towel rails on the sides and a shelf underneath. If you’re planning to go for this style in your bathroom, make sure you have plenty of room, freestanding pieces and opulent décor are galore in a traditional bathroom; the Westminster Pan with a high cistern might fit your design perfectly, but you need to ensure you have the height in the bathroom to encompass this standout piece. The final finishing touch to an outstanding traditional bathroom is to use your flooring in a unique way – choose from a range of period tiling including mosaic, Elizabethan and Tudor to complete your bathroom. A more modern and contemporary bathroom can be perfect for the bachelor looking for a sleek sophisticated look or a space saving family. Typically modern bathroom furniture features pieces that will fit around your lifestyle while looking up to date and fancy. The gorgeous wood finished Breathe range by Roper Rhodes will give an instant update to tired looking bathroom which will fit seamlessly in with what you already have. Not only that, but it combines its strong aesthetic with functionality including a water saving dual flush as well as a soft closing lid. If you’re looking for something a bit more fun for your bathroom though, Roper Rhodes can help you with this too with a funky LED shower head; as the temperature rises from cold to hot, the colours cycle through from blue to purple and finally red. You’re bound to have the coolest and most contemporary bathroom around with Roper Rhodes! When investing our money in a new home, it appears that luxury bathrooms are one thing home buyers are looking for. Although space is key when looking for a home, along with a good kitchen, it seems that luxury bathrooms are also high on the list. People would fawn over newly remodelled kitchens and they would add £1000’s onto asking prices and it now looks like luxury bathrooms are following suit. Not just entertaining spaces but also personal spaces need to be top notch, in a hectic world, there is nothing better than relaxing in a luxury bathroom, with a massage shower or whirlpool bath. His-and-hers bathrooms are on the rise with the number of people adding this to a list of must haves when buying a property, some more so than en-suites. Sinks for both, gives extra space and makes co-habiting in a bathroom as a couple much more pleasant, as there is less chance of a fight for space. His-and-hers bathrooms originally were only really found in high end luxury homes, however home buyers and home builders look to maximise on this popularity, which for many is only really enjoyed in hotels. And it’s not just home buyers with a keen interest in luxury bathrooms and his-and-hers bathrooms, those not wanting to move look at creating a luxury bathrooms for themselves instead. Many people looking to create a sanctuary in their home and somewhere where they can relax. An investment in a luxury bathroom will pay dividends in your health and wellbeing. It’s much easier to relax, when your space isn’t cramped and you don’t have lots of clutter around. As house prices continue to rise despite a credit crunch, home buyers are of course being savvy and wanting to make sure they get as much for their money as they can when buying a new home. Other rooms in a house can be easily repainted or carpets changed, however changing a bathroom can be expensive and not a task you want to undertake when you have just bought your home. Along the same lines as new kitchens new luxury bathrooms, mean less work needs to be done by the new home owner and makes houses much easier to sell, especially in this tough market. Any home that is pretty much ready to move into is ideal for many buyers. Lighting is an important consideration for any bathroom, too little and you won’t be able to see what you are doing and too much you lose the relaxing feel. There are plenty of bathroom lighting options on the market and they needn’t be drab or boring, so check out our favourite bathroom lights from world renowned manufacturer Imperial Bathrooms. Who knows, it might even inspire your new bathroom design. The Imperial Avila Wall Light with Glass Shade is a modern yet elegant wall mounted light. This chrome fixture goes perfectly in any bathroom and the clear glass shade provides just the right amount of light. This wall mounted light has concealed fixings to provide a professional look and is perfectly suited to the bathroom environment. For those who want a more traditional look the Imperial Brokton Wall Light with White Linen Shade is the deal choice. Featuring a chrome adjustable wall bracket and a moisture resistant linen shade, this light provides a warm, relaxing glow. For that truly luxurious look, the Imperial Cadiz Wall Light with Glass Shade is a great choice. The traditional globe opal glass shade and chrome wall bracket come together to create a luxurious focal point in any bathroom and the concealed fixings provide that professional look. The Imperial Cadiz Wall Light is great for those who want to create a dramatic atmosphere in their bathroom. Having adequate lighting around you bathroom is important especially when shaving or applying makeup. This is where the Imperial Toledo Double Wall Light & Glass Shade comes in. this elegant double light is perfect for hanging above the bathroom mirror and gives off a relaxing glow. All Imperial Bathroom lights come with a 5 year guarantee and are suitable for zones 2 and 3 in the bathroom. There are companies that can claim to have been in the business of making taps and accessories for the bathroom for longer than Crosswater, but few can lay claim to making products that all carry a ten year guarantee. There are 531 products within the Crosswater range and obviously the best way to see these is to look through them at the pages of the Crosswater section at our web site. To give you some idea of one of the taps within their range the Crosswater Water Square Basin Mixer is one example of demonstrating that a basin mixer tap does not just have to be functional, it can be eye catching also and this one certainly is, delivering a river of water mixed to the right temperature to your basin. Just a few added touches can transform the look of a bathroom or cloakroom area and by doing so it can mean a new area without the need to change all the sanitary ware. One simple idea is to change the colour scheme, perhaps re-tile the splash back and add some new blinds or curtains. But one that is sure to give the room a whole new look is to fit a new modern toilet seat to the existing WC pan. The Imperial Astoria Deco Oval Toilet Seat is one of many toilet seats that we can offer and with Imperial’s products you are assured of quality. These are manufactured in-house by skilled specialists and are hand-finished to exacting standards that set the benchmark for quality throughout the bathroom industry. Designed and painstakingly handcrafted by Imperial in the UK to the highest standards, styling is complemented throughout by traditional touches. The seat is available in Wenge, White, Mahogany or Natural Oak; the hinges are chrome finished and have a soft closing style. 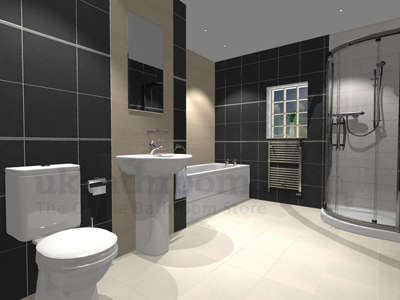 There is an increasing trend toward bathroom suites that have a shower instead of the traditional bath. The Arezzo basin with WC and shower is an ideal entry level bathroom suite, which is exclusive to UK Bathrooms. The popular Arezzo range offers clean good looks at a great price. With quality components from leading supplier and manufacturer Vitra, everything you need for a complete bathroom installation is here, in one easy to order package. The package comprises the Vitra Milton contemporary wall mounted wash basin, the matching Vitra Milton close coupled WC and standard seat, completed by the stunning Sommer Quadrant Double Door Shower Enclosure. The installation is ideal for smaller bathrooms or where space could be limited. Choose Arezzo for an economical yet elegant bathroom. Finish the look with our great range of Porcelanosa wall and floor tiles for a bathroom you’ll be proud to bathe in. You will be completely soiled for choice at the web pages of UK Bathrooms but one illuminated mirror which has proved to be a popular choice of many is the HiB Cosmo mirror. This is a rectangular double layered bevelled mirror with chrome covered strip light in a size of 70 x 50 cm adequate for most bathroom purposes. The light which is incorporated illuminates the mirror in a subtle manner and it also provides background lighting in the bathroom or en-suite area. The lighting conforms to standard requirements and is operated by a pull cord. An addition popular with many buyers is the optional de-misting pad which is available with this mirror. The lighting is through a T5 fluorescent lamp which is eco friendly and has long life characteristics. Everyone should try to use water sparingly in their bathroom. Some good tips include things like not running the tap while brushing your teeth. A dripping tap leaking ten drops per minute will leak 170 litres in a month so leaky taps should always be fixed as soon as possible. Taking a shower instead of a bath saves an incredible amount of water a quick shower uses 50 litres of water instead of a bath which uses 150 litres. A water-saving shower head can be fitted to prevent heavy water flow and saves a lot of water per household. Installing an economy flush on a toilet is a good idea as it allows the toilet user to select a light or heavy flush, instead of always flushing a large amount of water each time it is used. The cistern of the toilet should be checked regularly because leaking seals can also waste massive amounts of water.